Register for “Hoopin’ For Hope,” a charity basketball tournament! All entry fees, sponsorship and donations are 100% tax deductible and go directly to support the youth programs at Oak Hill House & School. Medals & Trophies will be awarded to top teams in each division. 50/50 Raffle • Silent Auction • Half Court shots for prizes • and other fun activities! Have you heard the great news? Mike Diamond, owner of Manta Ray Records, and Oak Hill House & School are involved in a life-changing program designed for youth in placement and foster care, called “Leadership Through Music”! This program allows teams to work on 3 singles, submit their best single for judging and win the chance to have the winning single released for public consumers, radio and purchase! Three of our boys are finishing up their winning single now and we plan to make this program available to more agencies once we finish this pilot! Thanks Mr. Avey! Thanks Mr. Mike! Thanks Mr. Stephan, our Residential Director, who spent the last few months working with the guys to complete their project! This project taught the guys leadership development, healthy competition, task completion, time management, deadline adherence, social skills, team work, music industry career opportunities, and how to manage themselves in the community among other valuable skills! Needless to say, their self esteem is through the roof! A special thanks to all the parents who allowed their children to participate! Stay tuned for more good news from Oak Hill House & School! CLEAR SPRING, MD – Officials at Oak Hill House in Clear Spring are hoping to purchase the building they operate in. That’s why they’re planning a basketball tournament called “Hoopin For Hope” at St. James School in an effort to raise money. They say the funds will also be used to move a step closer to purchasing the house and continue their mission to assist troubled youth throughout the state of Maryland. As a non-profit organization, officials at Oak Hill rely on donations from outside sources. 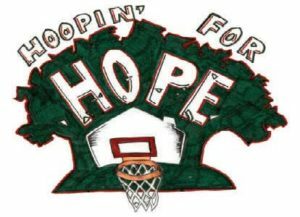 The “Hoopin’ for Hope” tournament will be held on March 17th and 18th. The registration deadline is March 1st. Please come and support our yard sale to be held on Friday, October 14th & Saturday, October 15, 2011 at 12806 Independence Road, here in beautiful Clear Spring, Maryland. Can’t come out? No worries, maybe you have some things you’d like to donate to help instead. We will pick it up from anywhere within a 50 mile radius. Just call me at 301-582-4980 ext. 207 and we will make arrangements. Hope to see you there ! Oak Hill House Car Wash and Raffle Was Fun! Status Quo is Not an Option @ Oak Hill House & School! We had an amazing fiscal year 2011. It’s no small wonder we made it through some of our toughest times to excel into a new level of excellence. We’ve had eight successful discharges between July 1, 2010 and June 30, 2011! We’ve had models emerge with Anderson Photography donating a photo session. We’ve seen every football game in the NFL thanks to Mr. Brian Lynch, President of Antietam Cable Company in Hagerstown. We have CopyQuik, DatAchieve, the Pittsburg Pirates, Document Solutions, Wal-Mart on Garland Groh, St. Joseph’s Church and a host of private humanitarians who constantly support our cause. Capital One Bank and multiple local businesses help keep our kids secure, maintaining a wonderful place to grow and thrive. Stay tuned for our Car Wash Fund Raiser on September 11, 2011 at Advanced Auto on Halfway Blvd and Virginia Avenue in Hagerstown and our Yard Sales throughout the Summer. Use our PayPal function to make donations anytime. Let’s Make a Difference- I Can’t, We Can! Oak Hill House Gets Loan from Capital One! Exciting news…Our much anticipated goal to ownership is well underway. Capital One has pre-approved us for a loan to buy our house and save our program but we need the down payment to complete the process. We’d like to thank our supporters for encouraging us, for making donations to our various projects including the Advanced Auto Car Wash & Raffle, our Yard Sale, Domino’s Pizza Dough Raising Cards and many upcoming events to follow. We have The First Annual Oak Hill House Fundraiser Dinner, Silent Auction & Raffle coming up on November 6, 2010 from 6pm-9pm at the Hagerstown Eagles Club on Locust Street in Maryland. Gold’s Gym, G&G Restaurant & Martini Lounge, Spicher’s Appliances, Momentum Auto Works and a host of other generous business owners have donated items for the silent auction and we are sure you will enjoy the full course dinner we will prepare for you and your guests. We will have a cash bar which is very reasonable and every ticket enters you into a chance to win cash or prizes. The cost is $10 and we look forward to sharing another wonderful soiree with our business supporters and you! Call us at 301-582-4980 to purchase tickets or to make a donation. All proceeds go towards the down payment of our property purchase and we need $100,000 to make this happen. Please come out. Its Family Day at The Oak! What a Wonderful Event! Today, October 2, 2010 from 11am-4pm, its Family Day! We have 85% family participation today and we are brimming with gratitude for those folks who showed up to support their children. We also have our DJS Resident Advocate who accepted our invitation to come and we are looking forward to some administrators from Cedar Ridge to hang out with us a bit today as well. Oak Hill House is one of the only programs to perform services for family therapy in the homes twice per month and offer weekends and Family Days in this capacity. Those youth whose families couldn’t make it earn money as they work to assist staff in facilitating this event. We are Oak Hill House proud!